Discussion in 'GPS Tracks - Central, Texas & Gulf States' started by Cannonshot, Feb 20, 2011. I remembered that Mike put together a great route and a fun ride so I thought it might be nice to convert the roll chart to a GPS file so that others could enjoy it as well. I prepared a GPS file of Mike's excellent ride that contains track lines and routes so it can be ridden either way. There are two routes in the file, one drawn in CN 2010 and one drawn in CN 7 to accommodate more units (pick the one best for your unit). By the way, it is pretty clear that Mike has been a long time enduro rider because his roll chart was of high quality. 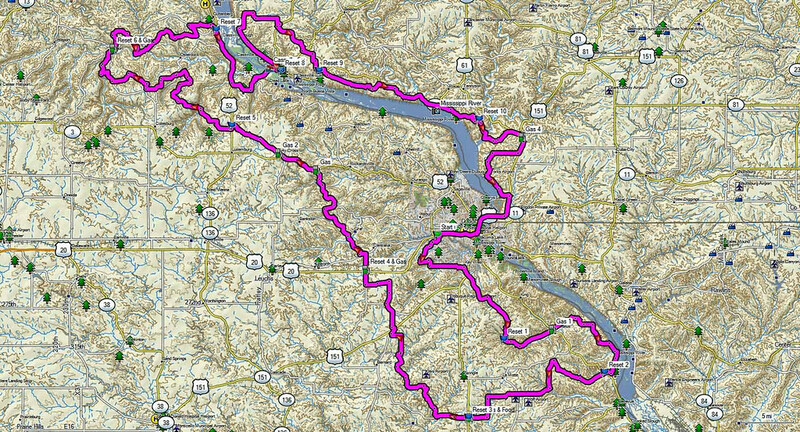 The ride itself is a 211 mile run on mostly gravel roads that wind across the scenic and entertaining elevation changes along the Mississippi River in NE Iowa and SW Wisconsin. There are some level B roads that may be muddy if conditions are wet. There is plenty of gas along the route. The ride also involves a ferry crossing of the Mississippi River. Mike told me that there could be some minor changes on the route with regard to B roads, so be prepared to adapt on the fly if need be. Here are some overview maps of the ride. It would be fun to hear from Mike and some of the guys that were on that 2005 ride. I'm sure anyone that was there would recommend the route.